The net profit of the company increased marginally to Rs.2,235 crore in Q4 FY16 as against Rs.2,234 crore in Q3. 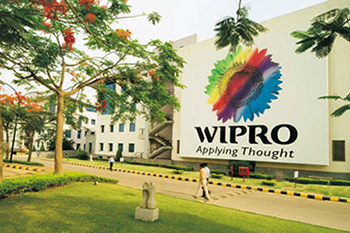 Wipro cracked 6.2% to Rs.564 on BSE. The IT company registered a 6% rise in net revenue at Rs.13,742 crore in Q4 as against Rs.12,952 crore in Q3. The net profit of the company increased marginally to Rs.2,235 crore in Q4 FY16 as against Rs.2,234 crore in Q3. The company’s revenue stood at Rs. 13,741.70 crore, clocking growth of 6.1% qoq and 12.9% yoy. The scrip opened at Rs. 570.05 and has touched a high and low of Rs. 578 and Rs. 560 respectively. So far 2504616(NSE+BSE) shares were traded on the counter. The current market cap of the company is Rs. 148574.19 crore. The BSE group 'A' stock of face value Rs. 2 has touched a 52 week high of Rs. 613 on 01-Oct-2015 and a 52 week low of Rs. 508.9 on 29-Feb-2016. Last one week high and low of the scrip stood at Rs. 606.75 and Rs. 580.5 respectively. The promoters holding in the company stood at 73.34 % while Institutions and Non-Institutions held 16.18 % and 9.87 % respectively.